Anaklia Development Consortium’s (ADC) along with USAID held a meeting on September 10 at Marriott Tbilisi. 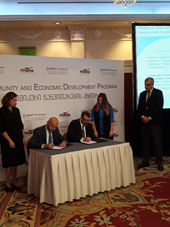 ADC CEO, Levan Akhvlediani and USAID Zrda’s Chief of Party, Brian King signed a Partnership Agreement within the Anaklia Community and Economic Development Program. The agreement envisages the investment of $2 million to promote the regional economic development of Anaklia/Zugdidi and its surrounding areas. USAID Zrda and Anaklia Development Consortium are investing $1 million each in the joint project. “This is a social program which aims at economic and sustainable development. Our involvement with USAID is very important,” ADC CEO - LevanAkhvlediani noted. USAID Mission Director Peter Wiebler, ADC Founding Partner, Mamuka Khazaradze, and other public and private sector representatives attended the event. The project will focus on three main directions including increasing the competitiveness and growth of MSMEs in the region, building a workforce qualified to meet the market demand for both port operations and the broader economy in the region, facilitating the development of community infrastructure necessary to meet Anaklia and the region’s needs. “Anaklia touches upon social and economic topics as well. Today, Athena – one of the biggest container ships crossed the Bosporus and will visit Georgia for the marine works to start in Anaklia,” said Khazaradze. ADC is a Georgian-American consortium, mandated to develop the Anaklia Deep Sea Port following the Investment Agreement relating to the build, operation and transfer of the Anaklia Deep Water Black Sea Port dated 3 October 2016 between ADC and the Government of Georgia. The USAID Zrda Activity in Georgia is a five-year program designed to promote inclusive and sustainable economic growth in 81 communities of five regions of Georgia by improving MSME growth, increasing the productivity of rural households, facilitating market links between producers and buyers, and promoting local economic development by establishing and strengthening networks.